There are few restaurants that I find worth the long wait, especially when I am hungry. 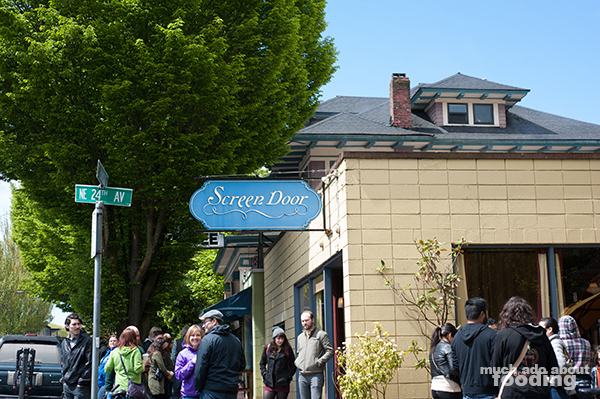 Luckily for Screen Door in Portland, it is one of those that proved itself justifiably busy. Our friend had suggested this spot for a good brunch but apparently the whole of Portland knows this to be a true as well. We put our name down and anticipated an hour wait, expected once we saw just how many people were milling about outside (and inside) waiting for their names to be called. The food is Southern-style and superb. Never mind how crowded it gets inside nor the aggressive quickness with which the staff moves. 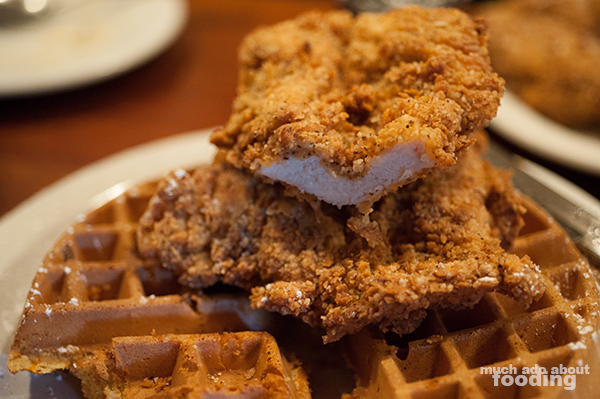 Once you get a bite of their well-known chicken and waffles, you'll know why they find themselves packed before they even open. Duc couldn't get pictures of this place from the outside without snapping shots of the many waiting customers outside. There were some benches out front, presumably a reaction to the volume they expect. Once inside, we sat at the bar since a table wasn't necessary. Most tables were full of large groups anyway so it seemed easier to get the service up front. 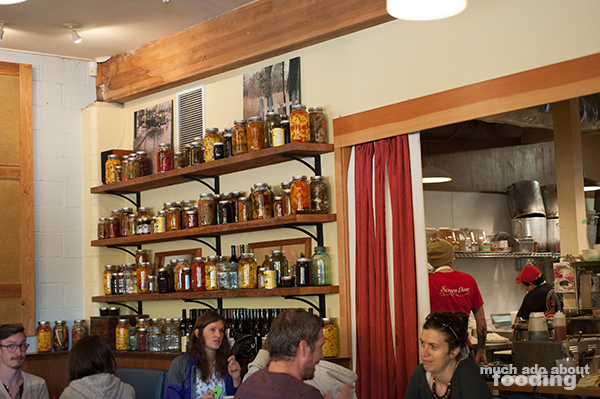 The decor was similar to a Southern home's with plenty of jars along the shelves, filled with colored brine and pickled who-knows-what. The open kitchen with only a cloth curtain separating runners from the tables could have been the kind of kitchen that one would entertain from in one's own Southern house. I liked the charm! There was much hurrying back and forth though but that also ensured that all of the food arrived steaming hot. 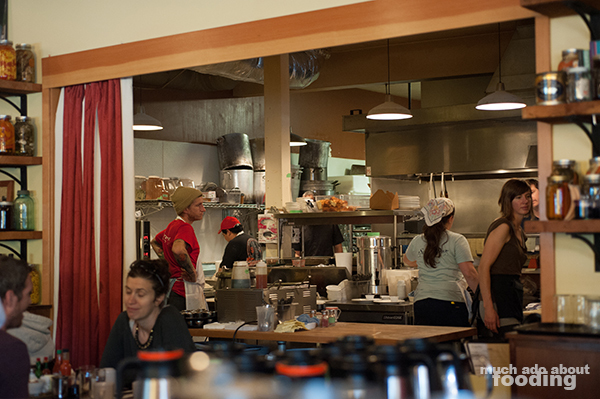 We spotted a huge list of specials which must change frequently since it was printed on paper. Some potential options on the main menu include Fried Oyster Benedict, Bananas Foster French toast, Breakfast Po-Boy, and Carolina Pulled Pork Sandwich. There was also plenty of options using pimento cheese, a Southern favorite. Everything looked extremely promising before we even started on our food. 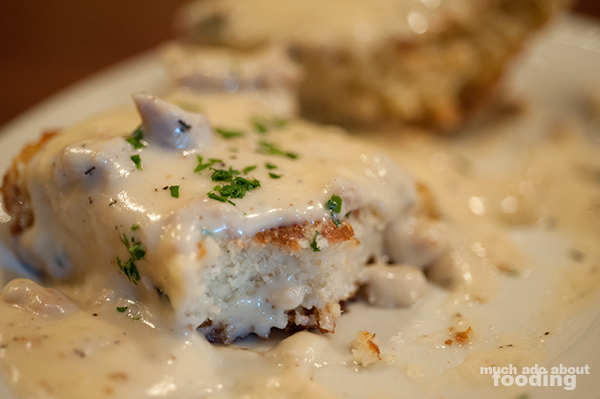 How do you go to a Southern place and not try out their way of doing biscuits and gravy? Because we had our eyes set on other entrees, I opted for the One Biscuit with Sausage Gravy ($4.50) to start us off as an "appetizer" of sorts while we watched the frantic bartender make endless Creole Bloody Mary cocktails. It was Sunday brunch time after all! 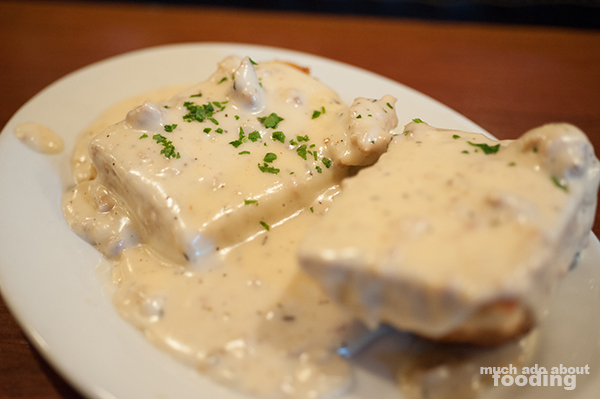 The biscuits was as fluffy as it could be, buried under the sheer weight of gravy. I really enjoyed the fatty sludge atop the biscuit and could really appreciate the sausage drippings they used in it. Next came out the Cajun Scramble ($8.95 - with Andouille sausage, bell pepper, onion, Cheddar, and green onions) with side of grits and wheat toast. 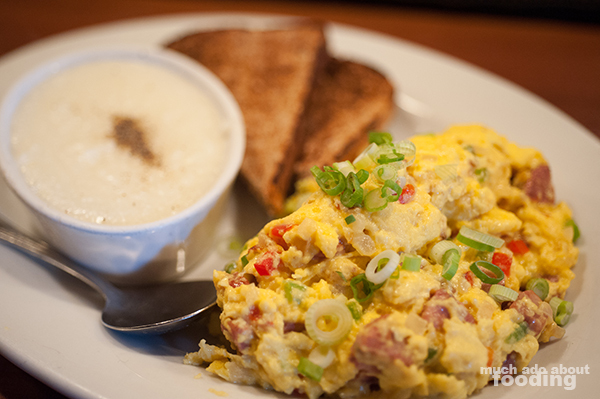 The other option for a side for scrambles was potatoes but who wants that when you can have lovely, creamy smooth grits? They were done perfectly without a need for extra seasoning or adjustment. The wheat toast was fair but the true focus was on the scramble which managed to hover between moistly runny and scrambled hard. I absolutely loved the way they cooked the eggs and would venture to say it was the best scramble I've ever hard, purely on the rich texture of the eggs. I'm not even sure how you could get it that way. The vegetables were also cooked very well and the sausage stood out with each bite. This is a would-get-again type of dish. 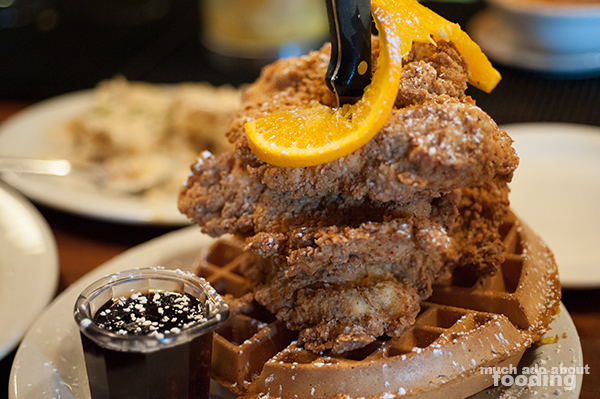 The true dish, however, that I would get over and over again is also likely the most popular there at Screen Door: Fried Chicken & Waffle ($13.95 - buttermilk battered fried chicken over sweet potato waffle). At first, I was hesitant to put this in our order because chicken and waffles seems to be done too frequently these days. What could make this one different? I was slightly curious about the sweet potato waffle but it wasn't until I peered into the open kitchen to see the runner stabbed an enormous knife through a stack of perfectly fried chicken that I knew we had to give it a try. Three large chicken breasts expertly breaded and fried to the perfect crunch were stacked on top of a thick, sweet potato waffle before being run through with a hefty serrated knife. Despite how crisp and fried the chicken was, it was mindblowingly juicy inside and cooked to the right temperature. The sweet potato waffle was not dry at all, and the sweet potato gave a pleasant cinnamon spice to the meal. It held its own very well against the tasty syrup, and because it was so hot and slightly moist inside, the waffle proved a worthy complement to the smashing chicken. Because the portion was so enormous, we had to save some for our plane ride home from Portland but even after a few hours, it was still incredibly crunchy. Bravo Screen Door!